Cristiano Ronaldo broke Jimmy Greaves’ long-standing European goal-scoring record with two goals in Real Madrid’s 4-1 win over Celta Vigo on Wednesday evening. Ronaldo (who soon added his 368th goal shortly thereafter) also managed to beat the venerable record in 68 fewer games, taking just 460 outings as opposed to Greaves’ 528. As the Portuguese league doesn’t qualify as one of the ‘Big Five’, Ronaldo’s three senior goals for Sporting Lisbon aren’t counted, so it all began with his 84 goals in 196 appearances for Manchester United, followed by a simply staggering 284 goals in 264 appearances (and counting) for Real. Greaves kicked off in 1957, going on to score 124 goals in 157 appearances for Chelsea, followed by 9 goals in 12 appearances for AC Milan, 220 goals in 321 appearances for Tottenham and 13 goals in 38 games for West Ham before retiring in 1971. 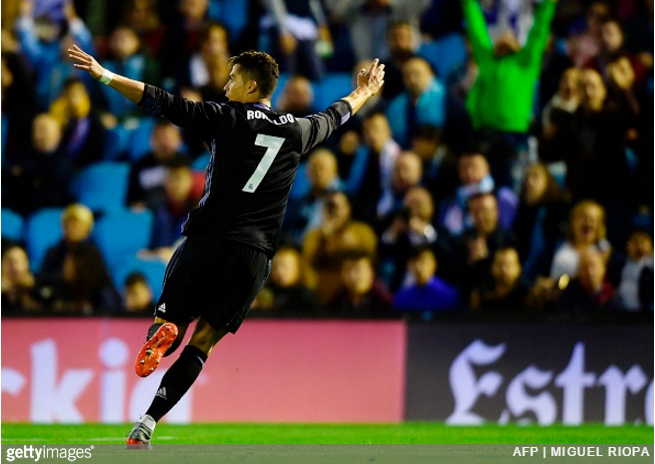 Perhaps more importantly, Ronaldo’s brace against Celta was also instrumental in Los Blancos moving to within one point of sealing the La Liga title going into their final fixture, Sunday’s trip to Malaga. It’s hard to believe that someone is doing this in modern football. If Ronaldo was born 50 years ago, he would be bigger than Pele and Maradona. Portugal doesn’t count as a ‘big league’ but somehow France does… pfft. One French team has won the European cup/ Champion’s League once. Portugal has two teams each with two wins.